This week we were lucky enough to be invited to try Tuk Tuk's new tiffin menu. The indian street food restaurant is somewhere I've been desperate to visit for the past few years I've lived in Edinburgh so it was a total dream to be invited along. The restaurant itself is totally original and nothing like anything else in Edinburgh- it's quirky, authentic and the kind of place you could take anyone from your nan or a first date. Because there was about eight of us they were very accommodating and set us at a big table all together in a sort of picnic long table style which was ideal for us all to interact and share food. The menu we were trying was their new 'Tiffin' menu which lets you chose a dish from each section of the menu which gave us a selection of four dishes. The whole idea behind the menu is sharing food and we were very tactical in our choosing to make sure we got as much as possible to try and swap about. Each dish arrives stacked in silver dishes which makes it even more exciting when you're opening them all up individually. I went for the minced meat samosa's, butter chicken, spinach, and pilau rice and I can 10/10 say that it was the best curry I've ever had. From the sweetness of the butter chicken to the perfectly cooked pilau it was just delicious. (Not to mention I was on a total hang so it could've gone one of two ways and it went the good way. Thankfully.) We all had a bit of each others and I can also say quite confidently the peshwari naan was also amazing- so so so tasty and soft. The only little issue was the lack of choice for our resident veggie Nicole. She could only really chose sides or dahl so I think she snuck a cheeky taste of my butter chicken sauce but that's something I'd hope they change. Although once we asked about the problem our waiter was keen to make sure Nicole was happy so their customer service is super. There's also a photobooth which is free to use so we obviously abused that to the point we took a minimum of about 14 pictures. Was totally fun though. If you've never been to Tuk Tuk please please go- the food is delicious, it's such a social place and they're fab with big groups so remember that Christmas is coming and all those rubbish Christmas dinners can be saved here. Tuk Tuk sounds like my ideal restaurant as I love Indian food - shame it's so far away! It sounds like a lovely place to eat at , its a pity they have not catered well for vegetarians, a market they are missing out on as there are so many vegetarians these days. Tuk Tuk sounds like a fab restaurant. Love the name. That photo is making me SO hungry! 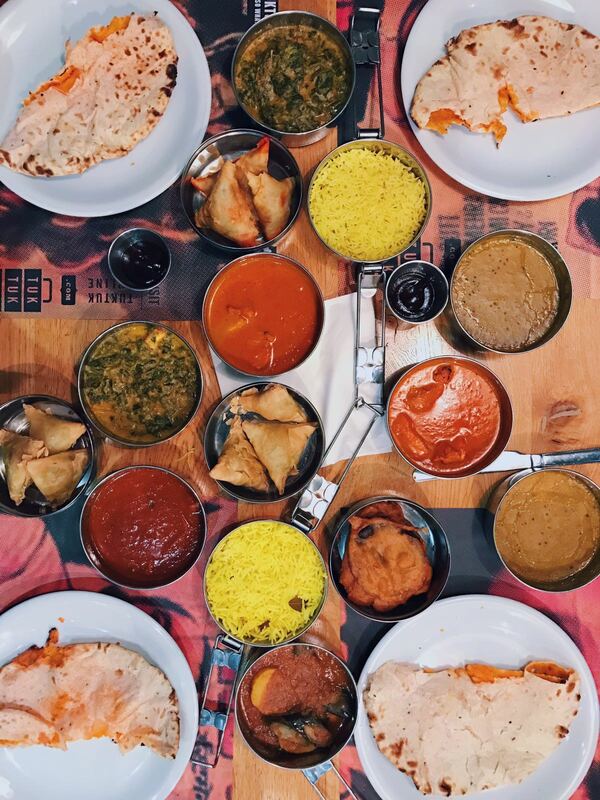 I love Indian food, as I'm in London and close to Brick Lane I have a lot of good options, thankfully! Tuk Tuk sounds fantastic, I love it when restaurants promote a sharing food menu, I always fine it more enjoyable eating with others when we are all sharing platters of food. It's quite popular in Hungary (which we go to every year) for restaurants to provide big plates of food. Eating is and should be a very sociable event. The food sounds incredible at Tuk Tuk, I love a good buttery curry! Tuk Tuk sounds like a fabulous place to visit! I love Indian Street food so this would be something I would love. Pity it's so far away!